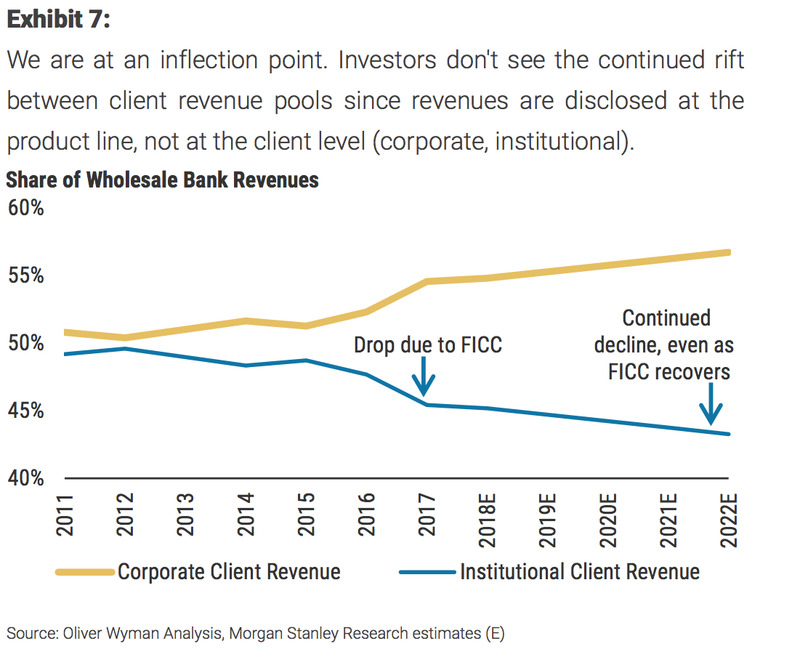 According to a big report from Morgan Stanley and Oliver Wyman on wholesale banks and asset managers, it’s now time for banks to shift their focus towards corporate business, versus the institutional investor clients they have been focused on. That’s because the asset managers are under intensifying cost pressure. 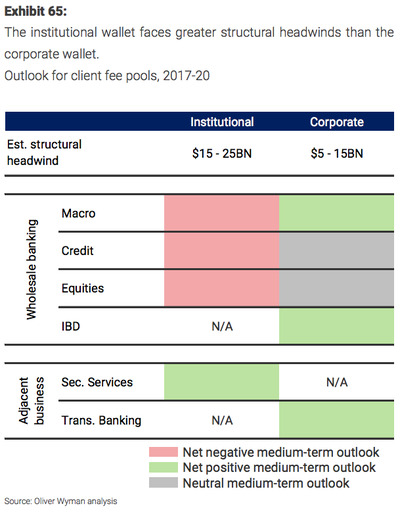 As a result, institutional client revenue growth over the next three years is forecast to slow to a compound annual growth rate of 2%. Corporate client revenues in contrast are forecast to grow at CAGR of 5% in the short term, as rising rates bolster various business lines. “Cyclical tailwinds are set to drive revenue growth in the corporate segment, but with very different dynamics between “CFO-down” and “CFO-up” relationships,” the report said. 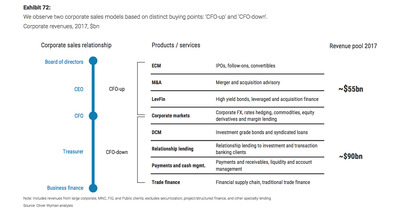 “CFO down” businesses include debt business, lending, cash management and trade finance. As the name suggests, these are usually delivered to the CFO and Treasury units. These businesses tend to be sticky and stable, and will benefit from rising rates. And it’s here that Morgan Stanley and Oliver Wyman are forecasting the fastest growth in revenues (5.5% CAGR over the next five years). 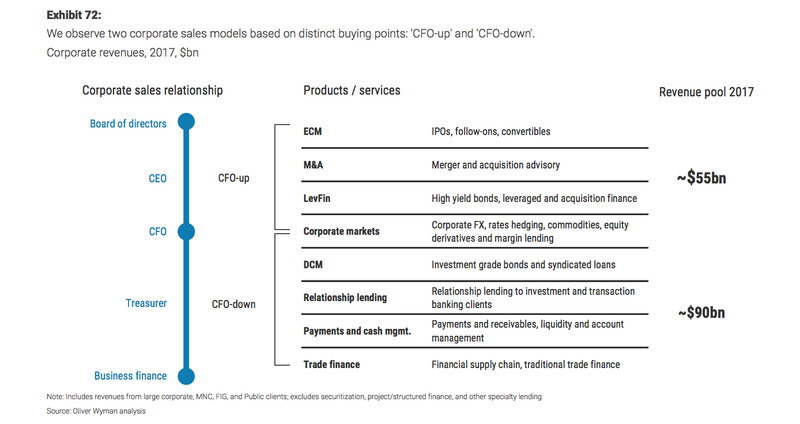 “CFO-up” products in contrast include headline grabbing equity deals, mergers and acquisitions, and leveraged finance. These are higher return businesses, but also more volatile and more relationship based. 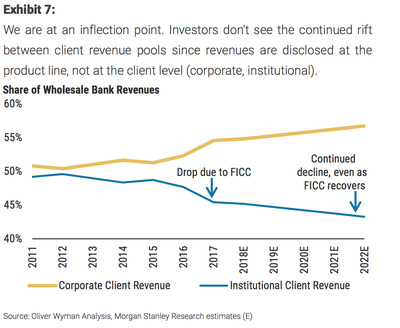 Specialised advisory firms have already eaten in to this revenue pie, taking market share from the bigger banks.